Utilization of seaweeds as plant protein source is of growing interest to the food industry in the developing countries (Fleurence, 1999; Wong and Cheung, 2000). People from Far East and Southeast Asian countries have a long tradition of consuming different types of seaweeds as a func-tional food (Mabeau and Fleurence, 1993; Darcy-Vrillon, 1993; Wong and Cheung, 2000). The applications of seaweed are not limited to human diet. Amongst 250 commercially utilized sea-weeds, more than 150 seaweed species are con-sumed directly by humans as fresh or dried form and rest of the species are used as animal feed, fertilizer, fungicide, herbicides and as thickening and gelling agents for various industrial applica-tions including foods (Fleurence, 1999; Kumari et al., 2010; Mabeau and Fleurence, 1993; Rupé-rez, 2002; Wong and Cheung, 2000). 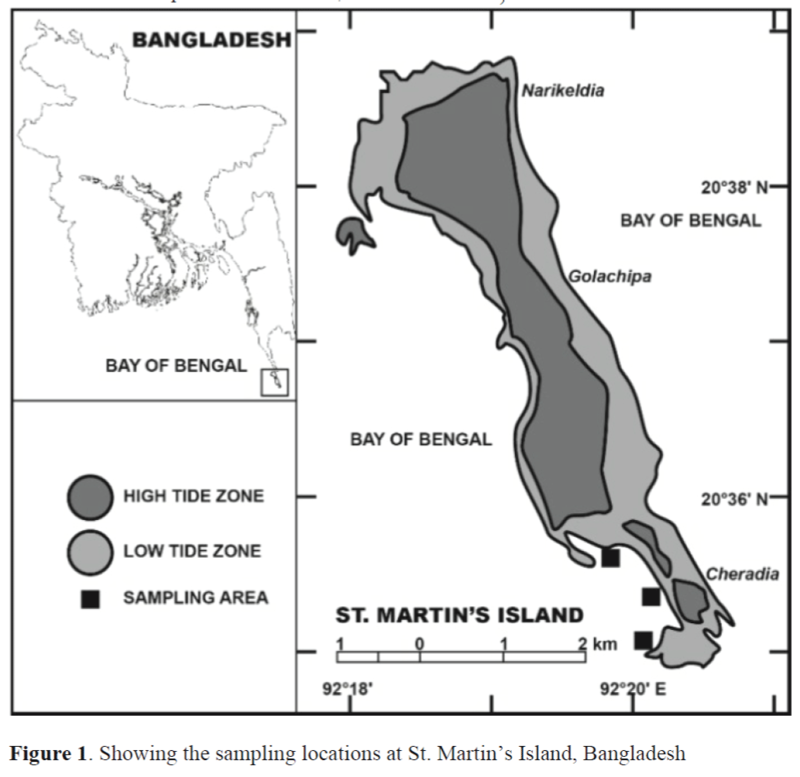 In Bangladesh, a total of 200 marine algal taxa (seaweeds) have been reported from the Saint Martin Island, Chittagong coast and Cox’s Bazar coast, Bangladesh, of which 98 taxa under 53 genera are reds (Aziz and Islam, 2009; Islam et al., 2010). Hypnea pannosa and Hypnea mus-ciformis are two commercially important red seaweeds in Bangladesh. About more than 100 households are engaged in seaweed collection by hand or push net from St. Martin’s Island. Col-lected seaweeds are sun dried on shore and dried seaweeds are exported to Singapore, Myanmar and China. A very few local people of St. Martin’ Island consume seaweeds in their diet, but other people of Bangladesh does not consume seaweed because they don’t have enough knowledge about the nutritional value of seaweeds. A number of studies showed that seaweeds are valuable sources of protein, fibre, fatty acids, vitamins, macro and trace elements, as well as important bioactive compounds (Darcy-Vrillon, 1993; Fleurence, 1999; Mabeau and Fleurence, 1993; Novaczek, 2001; Ortiz et al., 2006). Some trace elements are rare in terrestrial plants but they are rich in seaweeds (Ito and Hori, 1989; Rupérez, 2002). Seaweed contains bioactive products that exhibit antibacterial, antiviral and antifungal properties (Trono, 1999). Some com-pounds of seaweeds control high blood pressure, level of cholesterol, and prevent strokes. These can also be used as remedy for rheumatism, diar-rhoea, and for controlling the growth of tumour (Novaczek, 2001). It is also well argued that con-sumption of edible seaweeds have a positive ef-fect on human health because they can reduce blood lipid level, obesity and risk of coronary heart diseases (Benjama and Masniyom, 2011; Zafar, 2005). The nutritional properties of edible seaweeds are poorly studied in Bangladesh. The detailed nutritional compositions of H. pannosa and H. musciformis have not been determined in Bang-ladesh and nutritional data on these two species are not yet available. Therefore, the proximate chemical composition and amino acid composi-tion of these two seaweed species has a great im-portance to make the species edible and commer-cially viable to the consumers. The aim of this study is to investigate the proximate chemical composition and amino acid composition of these two red seaweed species in order to evaluate their potential nutritive value. The St. Martin’s Island is situated in the ex-treme South-Eastern corner of Bangladesh (roughly between 20° 34′ - 20° 39′ N and 92° 18′ - 92° 21′ E) and separated by a channel of about 8 km from mainland. The average turbidity (Secchi disc) of in-shore waters of St. Martin Island rang-es from 1.5 m to 8.0 m. Water temperature and salinity fluctuated from 22-29°C (Tomascik, 1997) and 21.0-33.5 PSU (Zafar, 2005), respec-tively, throughout the year. The Island has four coasts and naturally occurring seaweeds are not found in all these coasts. The western coast is suitable for proper development and growth of seaweeds. In this study, we have selected three sampling stations at a 200 m of distance in the Western part of the Island (Figure 1). Hypnea species were available throughout the year in these selected locations. Hypnea pannosa and Hypnea musciformis have been collected randomly by hand-picking from the study area at the time of low-tide during the month of May 2005. Fresh samples were tak-en into plastic jars and then kept at 4-5 °C for few days. In the laboratory, samples were gently brushed under running seawater, rinsed with dis-tilled water, dried with paper tissue and frozen at -20°C. Subsequently, the samples were freeze-dried in a Terroni Fauvel (model LH-1500) de-vice. The dried material was powdered manually with the use of a mortar and pestle and kept in desiccators containing silica gel, at room temper-ature, until the chemical analysis. The proximate compositions (Proteins, carbo-hydrate, crude lipid, fibre, ash and moisture con-tents) of seaweeds were determined according to the standard method (AOAC, 2000). Protein con-tent was analysed by the Kjeldahl method with a conversion factor of 6.25 to convert total nitrogen into crude protein. Carbohydrate content was de-termined as the weight difference using protein, lipid, fibre, moisture and ash content data (James, 1996). Crude lipid was extracted from the sea-weed powder in a Soxhlet extractor with petrole-um ether (Siddique and Aktar, 2011; Siddique et al., 2012). After ensuring complete extraction, petroleum ether was evaporated and the residue was dried to a constant weight at 105°C. Fibre was quantified on 2 g samples previously boiled with diluted H2SO4 (0.3 N). The mixture was fil-tered and washed with 200 ml of boiling water and NaOH (0.5 N). The residue was re-extracted, after washed with boiling distilled water and ace-tone and finally dried at 105ÃÂ°C to constant weight. The material was heated at 550ÃÂ°C for 3 h and the weight was recorded. The moisture con-tent was determined by drying the seaweed sam-ples in an oven at 105ÃÂ°C until a constant weight was obtained. The ash content was obtained by calcinations in a muffle furnace at 550ÃÂ°C for 4 h.
Amino acid analysis was carried out by ion-exchange chromatography under the experi-mental conditions recommended for protein hy-drolysates. Samples containing 5.0 mg of protein were acid hydrolysed with 1.0 ml of 6 N HCl in vacuum-sealed hydrolysis vials at 110°C for 22 h. Norleucine was added to the HCl as an internal standard. Tryptophan, cystine and cysteine are completely lost by acid hydrolysis. Hydrolysates were suitable for analysis of all other amino ac-ids. The tubes were cooled after hydrolysis, opened, and placed in a desiccator containing NaOH pellets under vacuum until dry (5-6 days). The residue was then dissolved in a suitable vol-ume of a sample dilution Na-S buffer, pH 2.2 (Beckman Instr., USA), filtered through a Milli-pore membrane (0.22 μm pore size) and analysed for amino acids by ion-exchange chromatography in a Beckman (model 7300) instrument, equipped with an automatic integrator. The ammonia con-tent was included in the calculation of protein ni-trogen retrieval, as it comes from the degradation of some amino acids during acid hydrolysis (Mossé, 1990; Yeoh and Truong, 1996). Data were expressed in terms of mean ± standard deviation and the mean values were ana-lysed by one-way ANOVA to detect significant differences between the species. Statistical analy-sis of this study was done by Statistical Package for Social Science (SPSS Version 16.0 for win-dows). The results from the proximate chemical composition of H. pannosa and H. musciformis showed that both of the species are rich in protein and dietary fibre. The mean percentage (dry weight basis) of protein and dietary fibre were found 16.31% and 40.59% for H. Pannosa and 18.64% and 37.92% for H. musciformis (Table 1); which were significantly different between these two species. When compared with H. pan-nosa, H. musciformis contained higher percent-age of crude protein and ash content. However, the mean percentage (dry weight basis) of crude lipid, carbohydrates and ash were 1.56%, 22.89% and 18.65% for H. pannosa and 1.27%, 20.60% and 21.57% for H. musciformis; respectively (Table 1). Table 1. Proximate chemical composition of H. pannosa and H. musciformis (dry weight basis, n = 3) collected from St. Martin’s Island, Bangladesh. The mean percentages of protein in H. panno-sa (16.31% DW) and H. musciformis (18.64% DW) were within the range of 10-47% for red seaweeds suggested by Fleurence (1999). Con-sistent with the previous studies, the results of this study confirmed that red seaweed contains higher amount of protein and dietary fibre than the green and brown seaweeds (Arasaki and Arasaki, 1983; Ratana-arporn and Chirapart, 2006). The mean percentage of protein obtained from H. pannosa and H. musciformis were higher than Gracilaria cornea (5.47% DW), Gracilaria changgi (6.90% DW), Eucheuma cottonii (9.76% DW) and Gelidium pristoides (11.80% DW) (see Table 2). In general, seaweeds are not considered to be good source of lipid content (Norziah and Ching, 2000). According to McDermid and Stuercke (2003) most of the seaweed contains less than 4% crude lipid at dry weight basis. In the present study, the mean percentages of H. pannosa (1.56% DW) and H. musciformis (1.27% DW) were in recommended levels for lipid content. Although, the present results were higher com-pared to some other red seaweeds; Gracilaria cervicornis (0.43% DW), Gelidium pristoides (0.90% DW), Porphyra tenera (0.70% DW), but the similar percentage of lipid were found in H. japonica (1.42% DW) and H. charoides (1.48% DW) (Table 2). The present study revealed that H. pannosa and H. musciformis are rich in dietary fibre. Alt-hough, the mean percentage of fibre in H. panno-sa and H. musciformis were slightly lower than H. japonica (53.2% DW) and H. charoides (50.3% DW), but it was much higher than the other red seaweeds reported in the previous stud-ies (see Table 2). 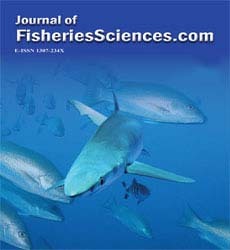 The higher amount of dietary fibre in H. pannosa and H. musciformis were probably due to the suitable environmental condi-tions such as temperature, salinity, water trans-parency and higher input of nutrients at St. Mar-tin Island (Haroon et al., 2000). The mean per-centage of carbohydrates in H. pannosa (22.89% DW) and H. musciformis (20.60% DW) were comparatively lower than other red seaweeds; but higher than H. japonica (4.28% DW) and H. charoides (7.02% DW) (Wong and Cheung, 2000). The mean percentages of ash content found in H. pannosa (18.65% DW) and H. musciformis (21.57% DW) were similar with other red sea-weeds (see Table 2). The mean percentages of ash in these two species were within the suggest-ed levels of ash ranged between 8-40% at dry weight basis (Mabeau and Fleurence, 1993). Some previous studies were argued that the varia-tion in ash content depends on seaweed species, geographical origins and their method of mineral-ization (Nisizawa, 1987; Sanchez-Machado, 2004). However, the mean percentages of ash found in this study were comparable to those re-ported in other species i.e., Hypnea japonica (22.10% DW), Hypnea charoides (22.80% DW), Gracilaria changgi (22.70% DW) (Norziah and Ching, 2000; Wong and Cheung, 2000). The two red seaweed H. pannosa and H. mus-ciformis contained all the essential amino acids, which accounted for 52.27% and 53.89% of the total amino acids; respectively. Lysine, methio-nine and tyrosine were the limiting amino acids for H. pannosa (53.3, 14.6 and 25.8 mg/g protein; respectively) and H. musciformis (45.6, 16.2 and 26.2 mg/g protein; respectively) (Table 3). The amount of Lysine in H. pannosa and H. musci-formis were slightly lower compared to Hypnea japonica (66.3 mg/g protein), Hypnea charoides (64.9 mg/g protein) (Wong and Cheung, 2000). 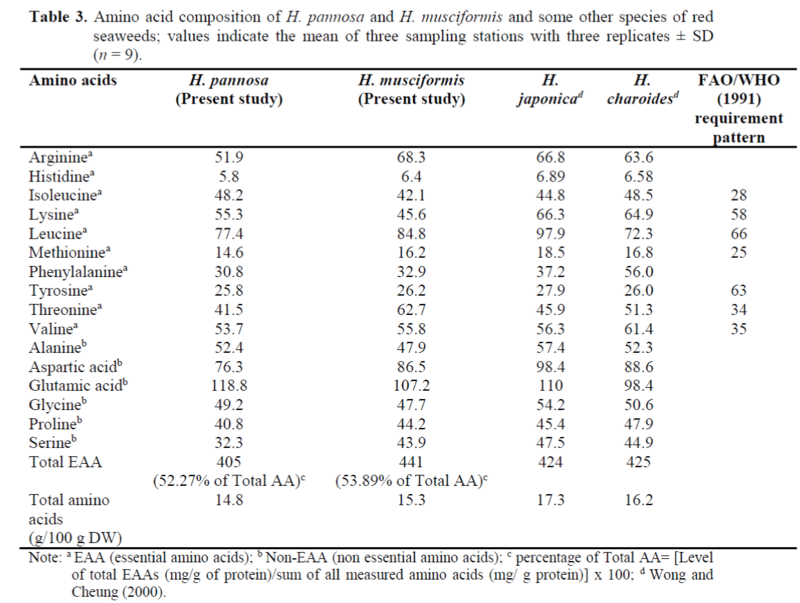 Furthermore, the level of other essential amino acids in H. pannosa and H. musciformis were above the FAO/WHO (1991) requirement pattern (see Table 3). With respect to the FAO/WHO (1991) requirement pattern, these two red sea-weed species seemed to be able to contribute ad-equate levels of total EAA. Table 3. Amino acid composition of H. pannosa and H. musciformis and some other species of red seaweeds; values indicate the mean of three sampling stations with three replicates ± SD (n = 9). Serine and proline were found as limiting non-essential amino acids in H. pannosa; where, ala-nine and proline were the limiting amino acids in H. musciformis. The level of glutamic acid in H. pannosa (118.8 mg/g protein) was higher than the other Hypnea species. H. musciformis con-tained higher amount of aspartic acid (86.5 mg/g protein) than that of H. pannosa (76.3 mg/g pro-tein). However, this amount was lower compared to other Hypnea species (H. japonica and H. charoides) (Wong and Cheung, 2000). Comparison of the present results for amino acid composition with available data on seaweeds is difficult due to the lack of previous studies from Bay of Bengal (Zafar, 2005). A number of previ-ous studies argued that red seaweeds has a ten-dency to show higher percentages of both aspar-tic and glutamic acids (Lourenço et al., 2002; Wong and Cheung, 2000). In H. pannosa and H. musciformis, aspartic and glutamic acids consti-tuted a substantial amount of the total amino ac-ids (25.18% and 23.67% of total amino acid; re-spectively). Similar results were reported previ-ously (Fleurence, 1999; Mabeau et al., 1992; Wong and Cheung, 2000). The presence of aspar-tic and glutamic acids in food ingredient is very important since they provide different types of flavour and taste to several food items (Mabeau et al., 1992; McLachlan, 1972). The results from this study revealed that H. pannosa and H. musciformis are rich in protein and dietary fibre. The nutritional composition to-gether with amino acid profile of the two red seaweed species suggested that they have poten-tial food value and could be utilized as functional ingredient in our food industry. Further studies on H. pannosa and H. musciformis should aim fatty acid composition, vitamins, non-starch pol-ysaccharide constituents, and trace elements and sensory perceptions to provide more detailed in-formation for safer and more versatile utilization of these seaweeds. AOAC, (2000). 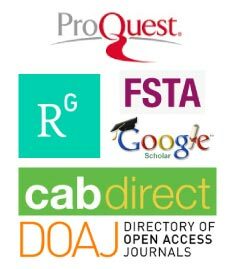 Official methods of analysis, 17th edition, Association of Official Analyt-ical Chemists, Arlington VA, USA. Arasaki, S., Arasaki, T., (1983). Vegetables from the Sea. Japan Publ. Inc., Tokyo. Aziz, A., Islam, S., (2009). Marine algae of St. Martin’s Island, Bangladesh. VII. Acrochae-tium nurulislamii sp. nov. and new records of Acrochaetium, Bangladesh Journal of Botany, 38: 145-151. Benjama, O., Masniyom, P., (2011). Nutritional composition and physicochemical properties of two green seaweeds (Ulva pertusa and U. intestinalis) from the Pattani Bay in South-ern Thailand, Songklanakarin Journal of Science and Technology, 33: 575-583. Darcy-Vrillon, B., (1993). Nutritional aspects of the developing use of marine macroalgae for the human food industry, International Journal of Food Science and Nutrition, 44: 23-35. FAO/WHO, (1991). Protein quality evaluation. Report of joint FAO/WHO expert consulta-tion, Food and Agriculture Organization of United Nations, Rome, Italy. Haroon, A.M., Szaniawska, A., Normant, M., Ja-nas, U., (2000). The biochemical composi-tion of Enteromorpha spp. from the gulf of Gdansk coast on the southern Baltic Sea, Oceanologia, 42: 19-28. James, C.S., (1996). Analytical Chemistry of Foods. Chapman and Hall, New York. Mabeau, S., Cavaloc, E., Fleurence, J., Lahaye, M., (1992). New seaweed based ingredients for the food industry, International Food In-gredients, 3: 38-45. Mclachlan, J., Craigie, J.S., Chen, L.C.M., Oget-zE, E., (1972). Porphyra linearis Grev: an edible species of Nori from Nova Scotia. Proceedings of the International Seaweed Symposium, 7: 473-476. Novaczek, I., (2001). A guide to the Common Edible and Medicinal Sea Plants of the Pa-cific Islands, Community Fisheries Training Pacific Series-3A, The University of the South Pacific, Fiji Islands, pp. 40. Ratana-Arporn, P., Chirapart, A., (2006). Nutri-tional evaluation of tropical green seaweeds Caulerpa lentillifera and Ulva reticulate, Kasetsart Journal of Natural Science, 40: 75-83. Tomascik, T., (1997). Management Plan for Cor-al Resources of Narikel Jinjira (St. Martin’s Island): Final Report, National Conservation Strategy Implementation Project-1, Ministry of Environment and Forest, Government of Bangladesh. Zafar, M., (2005). Seaweed Culture in Bangla-desh holds promise. Infofish International, Number 1/2005, January /February. p. 8-10.